The Disneyland of today is one of the most well-known places in the world. 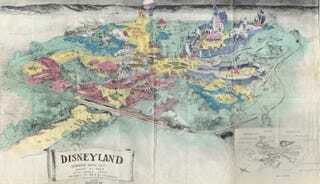 But in 1953, it was just sketches on paper, the pipe dream of two brothers named Roy and Walt Disney. In an incredible exclusive today, Boing Boing published the pitch document for the project—which is so rare, even Disney doesn't have it. Inside the nine-page brochure, we're introduced to Disneyland with copy from Walt himself describing this "new experience in entertainment." As Cory Doctorow explains in his post about the document, one of the main drivers of the pitch was how people would come to shop at Disneyland. Yes, even in 1953, it was all about "merchantainment," as Walt uniquely called it. But this wasn't just mouse ears and expensive dress-up gowns. No, at Disneyland, you'd be able to buy "magnificently plumed birds and fantastic fish from all over the world." Your kids would be outfitted with "scientific toys, chemical sets and model kits." There would be "slidewalks," "robotic kitchens," and a Lilliputian Land, where "mechanical people nine inches high sing and dance and talk to you." As commenter Seneca the Younger(er) points out, many of those dreams became at least temporarily true—including slidewalks. The kaleidoscopic feel of the descriptions are heightened by the aerial perspective map that accompanies them—this is a place of wild material fantasy.